Pre-polls and exit polls predicted a tough fight and a possible defeat for BJP. What they didn’t predict was such a massive wipe-out. More than losing the elections, for BJP, this is a PR disaster. Not only did it decidedly end the honey-moon period for BJP, it also established AAP as a credible force for future. It’s important to analyse how small failures contributed to this massacre. 1. BJP did not encash the factors which were working for her. Like not conducting elections in Delhi right after the massive Loksabha win. Became complacent and the delay costed BJP dearly. 2. Didn’t fully realise the importance of Delhi, even it’s symbolic value being the capital of India. And focused on other elections on priority. Probably winning 7 loksabha seats in Delhi had put Amit Shah at ease. 3. The delay in election gave AAP all the time in the world to recover their lost ground. Since for AAP this was a battle of existence, they used hundered percent of their energies and more in campaigning. 4. From campaign point of view – AAP’s campaigning was meticulous and covered entire Delhi. From making a detailed manifesto to selling it well to the voter. They did the job well. 5. BJP, on the other hand, on the local level didn’t do much to improve it’s image on local issues (like MCD) – and only relied on national issues and Narendra Modi’s image. It would have worked had their competition not been this vocal on local issues. 6. Amit Shah and Narendra Modi didn’t have much experience in the flavor of politics which Delhi became used to during & after Anna Andolan. At that time, they both were doing what they did well in Gujarat. 7. Delhi needed a more hands on approach. From that perspective, Delhi BJP appeared old-style & less responsive to prospective voter. Whereas Kejriwal and his team appeared more present and synced-in to the local issues. 8. When Amit Shah brought in Kiran Bedi – this showed naivety on his part in understanding the dynamics of Delhi politics. Amit Shah probably assumed one NGO-type face will counter the NGO-image of Kejriwal. However, that approach was absent from actions and agenda. So it appeared insincere. 9. Local leadership crisis – is probably the biggest reason why BJP got massacred in Delhi. 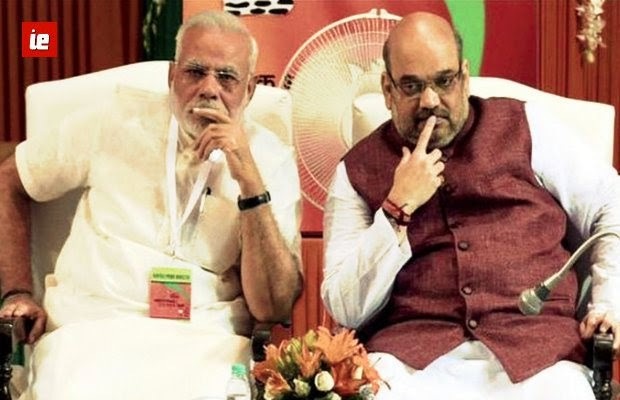 Amit Shah instead of picking one leader and selling him well – decided on bringing in a ready-made solution. This was again due to lack of time. 10. BJP relied heavily on highlighting the negatives of AAP and Kejriwal’s leadership – which probably would have worked if the attacks were not so direct. To a mildly informed voter, the negative publicity & using the name Kejriwal so much just consolidated his brand further. 11. It’s a misconception that AAP didn’t use negative campaigning against BJP – however public bought their negative campaign becaused they mixed it well with positive point-by-point agenda. AAP’s offering appeared more complete and not limited to citing history. 12. What worked in AAP’s favor was how they have a film-trailer like body of work – which gave Kejriwal the freedom to make big promises without much history of failures. Here probably a detailed agenda-based attack by a lawyer like Arun Jaitley would have worked. 13. BJP allowed it’s rural deranged fringe to overshadow it’s urban development agenda post general elections. What BJP doesn’t realise, probably still doesn’t, that how much approval they lose with every fringe meltdown. 14. During exit polls in Delhi – BJP acknowledged that they lost the slum demographic to AAP. That AAP also inherited Congress’s Muslims votebank. But the results show a completely different picture. Even the posh seats like RK Puram and Greater Kailash gave way to AAP. BJP lost many demographics, including that of young educated women. 15. BJP has not lost it’s voteshare compared to 2013 Delhi elections. However, compared to general elections, BJP has lost support. This, in a way, points to the fact that Arvind Kejriwal successfully made the Modi-factor irrelevant in Delhi. 16. Kiran Bedi, though being blamed, had a very limited role in this election. Putting her accountable would be continuing the denial approach and heading for more failure. Kiran Bedi’s complete lack of oratory in Hindi was an unpleasant surprise. But there was no time to correct it. Bringing a complete political naive in the last moment to save a national party showed underconfidence and undermined the confidence of the party cadre. 17. Media played a very important role in making AAP win in Delhi elections. And this unprecedented support was an interesting development. A party which was an untouchable for media during last Delhi election was being projected as a winner a full month before the elections. The tone of media during Delhi elections was to teach BJP a lesson – and not that of impartial analysis. Day and night chants of Kejriwal-nama in media sure turned many fence sitters towards AAP. 18. Funds played a big role in making AAP win. One could see how Delhi was covered in expensive hoardings. It’s strange how even a well funded party like BJP had to limit it’s advertisement for the very end – while AAP had been putting hoardings for months. AAP also managed the prime time TV advertisment on all major news channels. There were more AAP ads than BJP ads on TV. One could guess that AAP wasn’t that cash-strapped that it would like the voter to believe. 19. Lastly and most importantly, BJP failed miserably in selling it’s own positive work. They got so focussed on counting the negatives of Kejriwal so much that they forgot to place their own bets. Had they presented a credible offering while deriding Kejriwal, the picture could have been much different.